Having driven back from South Carolina yesterday, Mrs Velkyal and I will be on our travels again in order to mark the new year with Relentless Thirst's Eric, and a few others. I am sure that much good beer will be imbibed and discussed, I am looking forward to it very much, and my kilt will be making an appearance as well. As in previous years, tomorrow will see the beginning of my annual alcohol fast/detox, and given the fact that I generally only drink at weekends these days, my first beer of 2011 will be on February 4th at the earliest. Of course, I have stocked up on material for the blog, so it will be business as usual on that front. All that remains then is to wish you good people a happy and prosperous 2011. 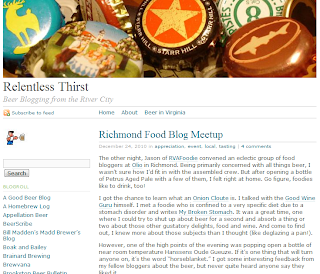 I have a tie for the best beer related blog from Virginia simply between Eric and James, of Relentless Thirst and A Homebrew Log respectively, cater to different aspects of my love of beer. Relentless Thirst has wide ranging posts of various aspects on the beer world which I find well thought out and thought provoking, whereas A Homebrew Log does exactly what it says on the tin - it is about homebrewing, but it is well written and always informative. I have had the pleasure of sharing beers, both commercial and homebrew, with both Eric and James, and they are top blokes, with a passion for beer and brewing. Keep your eyes open for an upcoming project the three of us are working on. If you know anything about me, you know I love session beer, and what to see more of it produced over here in the States. Lew's The Session Beer Project then is an invaluable resource for keeping abreast of developments in session beer across the US. What can you say about Ron that hasn't already been said? 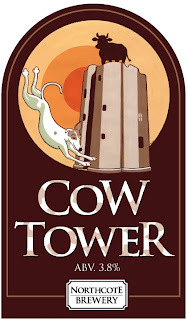 Challenging, backed up with facts rather than fables and recipes to brew historical beers! 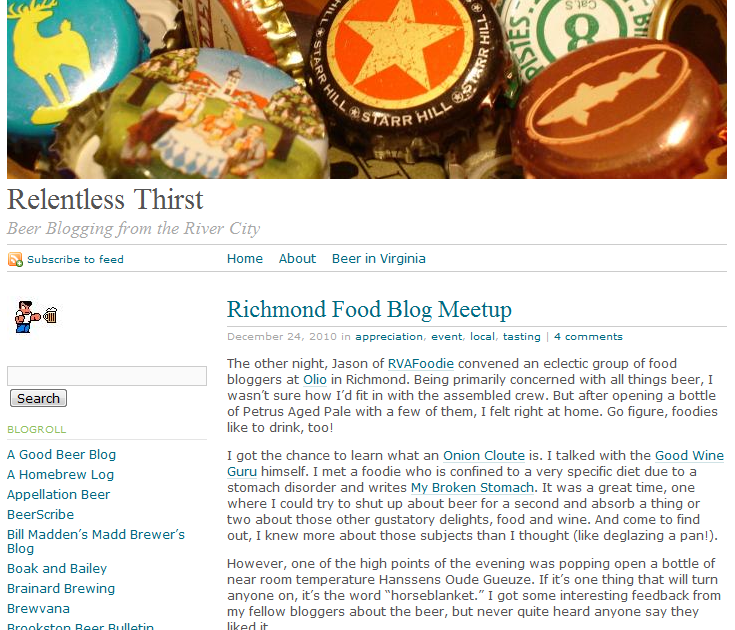 Not only is Ron's blog required reading as far as I am concerned, but the fact that it was one of Ron's books that inspired Devils Backbone to brew a 1904 London Stout recipe, which was one of my favourite beers of the year, has to be a good thing. Excellent reading all round and here's to another year of banging the drum about IPAs real nature! Virginia - Starr Hill Dark Starr Stout, Blue Mountain Original Summer Mild, Williamsburg Alewerks Tavern Ale, Devils' Backbone 1904 Ramsey Stout. Ok, so on to the beers that made the list. The Washington's Porter from Williamsburg Alewerks is a beer that not only made excellent drinking, but goes well in fruit cake as well. Rich, chocolately and velvety, it is simply a wonderful beer that goes down insanely easily and is so packed full of flavour that I wouldn't worry too much if all other beers were outlawed from midnight. My first taste of Left Hand's Milk Stout was in St Augustine, Florida. It was hotter than hell and to be perfectly honest stout of any kind would not have really hit the spot, though tasty it was. Come autumn, the leaves and temperature we plummeting and Left Hand had taken over the taps at Beer Run, along with Terrapin. Milk Stout, poured into a pint nonic? Yes please. A second just minutes later, you bet! Everything you expect from a stout, and then the creaminess of lactose. Simply lovely. I have waxed lyrical about Porterhouse's Wrasslers XXXX before, so when I learnt that bottles of this delightful stout would be available in the US I immediately emailed every bottle shop in Charlottesville to find out if they intended to stock it. Beer Run said they would and patiently I waited. Then I blew $40 on getting plenty when it arrived. Big on chocolate and with a healthy bitterness to balance it all out, this is one of the best stouts available. Sure there may be a hefty dose of nostalgia in my choice, but the fact that the $40's worth of Wrasslers in the cellar has been refreshed more than once is testament to my enduring love of this beer. I fear I am in danger of being accused of bias toward Devils' Backbone, but what the heck, Jason is making some superb beer down in Wintergreen, and Mrs Velkyal and I have been known to make the 45 minute journey just for a couple of afternoon pints. I can honestly say that I can think of no other brewery on the planet we would do that for, add to the fact that Devils' Backbone is only place near Charlottesville that we have taken every single visitor we have had, and that should tell you something. Ale of Fergus is kind of a hybrid in some ways, a cross between a mild and a 60/- Scottish Ale, though at a highly sessionable 4.4% it would be closer to an 80/-. I have a passion for beers I can put plenty of away, whilst still finding complexity and balance in the beer. Ale of Fergus is such a beer. Some people, for whatever daft reasons, have a downer on Samuel Adams, claiming they are too big to be a craft brewer, or some other specious nonsense. At the end of the day, they brew some decent beers, the core brands of which are near universally available - sometimes it just sounds like sour grapes. Anyway, I wrote about Boston Lager again back in the summer, whilst on holiday in Daytona Beach and the local shops had a comedically poor beer selection. This is where Boston Lager comes into its own - it is consistent, flavourful, easy drinking. Sure it might not be the sexiest, latest, uber-hopped imperial bourbon barrel aged fad de jour, but it is good beer and I find it always enjoyable. I love altbier. From the very first drop of Schumacher Alt at a festival in Berlin I have been a devotee of this fine style. Earlier this year I picked up a bottle of Uerige Doppelsticke at Beer Run (if I were doing a pub of the year, it would be Beer Run - which I guess just became a de facto award) and what a revelation it was - smooth, sweet, boozy and simply wonderful - I went back and bought more. An excellent example of German brewing excellence, and proof (though plenty more exists) that there is far more to German beer than Pils and hefeweizen - of course, you, good reader, already know that. If you know me, you know that Bohemian Pilsner is one of my favourite styles of beer. It is a style of beer that is very easy to get wrong, and exceedingly difficult to right, despite the simplicity of the ingredients. I will continue to maintain that only a triple decocted, 100% Saaz hopped brew can be called a Pilsner, anything else is just pale lager. It might be very drinkable, it might even garner rave reviews, but it is not a Pilsner. When I read on the Devils' Backbone blog, written by the brewer, Jason, that he was planning to make a Pilsner based on a recreation of the 1842 recipe devised by Josef Groll, I was immediately intrigued. That Jason then invited me to come out and help brew the beer made it all the more special for me - I say "help" in the broadest possible sense, that sense being the helping by not getting in the way, as much as possible. When the beer was lagered and available, avail myself of it I did, with gusto. It was simply an excellent version of one of my favourite styles. As I have said before, if I had been served that in one of Prague's many fine watering holes, I would have been delighted. There really is no higher praise. This is quite possibly the grossest heresy you will ever hear from a beer lover living in the USA. I am not a hop head. Don't get me wrong, I can appreciate hoppy beers, but I think that a lot of "craft" breweries focus too much on the little green cone to the detriment of the malt. For an IPA to get into my list of beers always in the cellar, it needs to have a good malty body to stand up to the hops. Enter, then, Sierra Nevada's quite simply gorgeous Torpedo. I think the thing I like most about Torpedo is that it isn't just another grapefruit bomb, the dry hopping with Citra lends it a more tropical fruit flavour which I find very appealing and a refreshing change from the Cascade/Amarillo dominated IPAs of this world. Balanced and yet nicely bitter, Torpedo achieves those three elements of good beer in my world, balanced, complex, drinkable. For my best Rest of the World beer, I head over the border to Canada and Unibroue's wonderful La Fin du Monde. Admittedly there was a late charge in the form of Unibroue's Don de Dieu which I polished off last night, but I followed that up with another bottle of La Fin du Monde, and the winner was easy really. For a 9%abv beer, La Fin du Monde is very drinkable, smooth and laced with banana aromas - almost as though they had been soaked in spiced rum. I first had some Unibroue beers by chance a few years back in France, and still count it as one of my favourite beer discoveries. Authentic ingredients, traditional methods and a spectacular result. This is what craft brewing is about in my opinion, and the Trukker Ur-Pils hit the mark in every conceivable way and is thus the Fuggled Pale Beer of 2010. 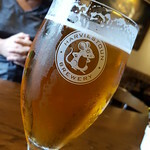 It being the festive season, the reviewer in every blogger inevitably makes an appearance, and really, how different is a review of the year from telling people how a beer tastes? In years past I have written somewhere in the region of 10 posts with the words "Review of the Year" in the title, looking at pale ales, pale lagers, dark lagers, stouts/porters and so on and so on. Simple really, only 4 elements to a review of year, and I won't even charge you a single pfennig for the pleasure. Ok, do you have an image in your head of Czech lager? Let me guess, it is golden, topped with a frothy white head (which, if well made and poured, can support the weight of a small coin), the nose is grassy, lightly lemony, all the things you expect from Saaz, the taste is bready and malty and when you get a great example of Czech beer you wonder why anyone would ever drink anything else. That is Czech lager, yes? The vast majority of the time you'd be right, but for the 5% of beer production in the Czech Republic devoted to the dark arts, to tmavý, or černý, ležák (dark or black respectively). Legally speaking the only official name for a dark lager in the Czech Republic is tmavý, and thus that is the term I will use. According to Czech tradition, or at least the things I was told by Czech men in pubs when I first moved to Prague back in the 20th Century, tmavý is beer for women, specifically beer to give women bigger breasts. What they neglected to mention was that the dark lagers of the Czech Republic are a whole different world from the Pilsner inspired golden lagers, and so it was only in my last few years in the city that I got a taste for them. When I went down to Devils Backbone to help brew their recreation of the 1842 Pilsner recipe, Jason and I discussed at length Czech beer, and came back again and again to tmavý and how it differs from the German dark lagers, dunkels and schwarzbier. We came to the conclusion that it would be an interesting project to brew a tmavý and so we set about finding as much information as we could. 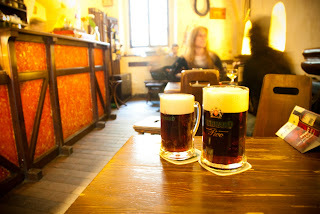 Emails were sent to various Czech brewers, websites were read in various languages, style guidelines were consulted, though not in the obvious places - certain websites are of the opinion that a Czech tmavý is either a dunkel or a schwarzbier. Why then do I maintain that tmavý should have it's own style? Simply because the history of dark lager in Bohemia is very different from that of Bavaria, where dark lagers preceded pale lagers by a few centuries, in Bohemia, however what became dark lager was dark ale until the 1890s - you could then argue, if you so wish, that tmavý is in reality more closely related to porter than dunkel or schwarzbier. 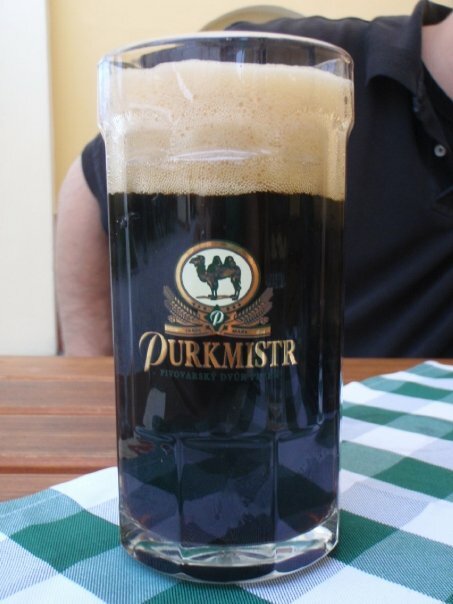 Indeed, the iconic, and distinctly stouty dark lager from U Fleků is known to have been warm fermented until that era. Having garnered the relevant information, got the necessary malts and hops, scheduled a time which worked for all involved, we got together on Saturday to brew. Taking part in the brewday on Saturday was myself obviously, Jason and Aaron from Devil's Backbone, Lyle Brown of Battlefield Brewery in Fredericksburg and Nathan Zeender, a journalist from DC, whose article in Brew Your Own magazine about kvass was fascinating. We used floor malted Bohemian pilsner malt, Munich malt, CaraBohemian malt and Carafa II special malt in the grist, and only Saaz hops in the boil, to achieve about 25IBUs, the yeast is Jason's prefered Augustiner lager yeast, and the brewery's incredibly soft well water. Because we wanted to be as traditional and authentic as possible, we did a double decoction mash. When everything was done, which took about 8 hours, we had, in the fermenter, 11 hectolitres of 14º tmavý speciál - that's 1100 litres or about 290 gallons. The beer will ferment for about 8 or 9 days and be lagered until, at the earliest, February 1st 2011, though ideally we would like to do 2 months worth of lagering. For naming this beer, I suggested, and Jason agreed, that we use the name of an ancient Slavic goddess, Morana, the goddess of winter and death, who goes under several other names as well, but Morana was the one I liked best. Traditionally when Spring comes, an effigy of Morana is burnt to celebrate the end of winter, and given the timing of the beer being released, it is kind of fitting that a beer dedicated to her would be available during the last throes of winter. 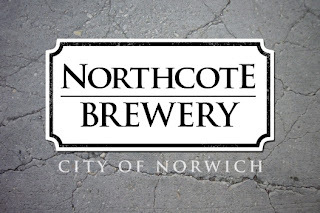 I’m very new to brewing, this is my first commercial brewing business, I’ve always been interested in food and drink and it seemed like a natural progression to go from drinking to brewing. I wanted to have my own business and with the recent surge of interest in real ale in the UK, it seemed like the logical step. You have to be hard working, and thorough. Obviously traits like being inventive and having a good palate are useful, but you wont get anywhere if you’re not willing to put in the hours. 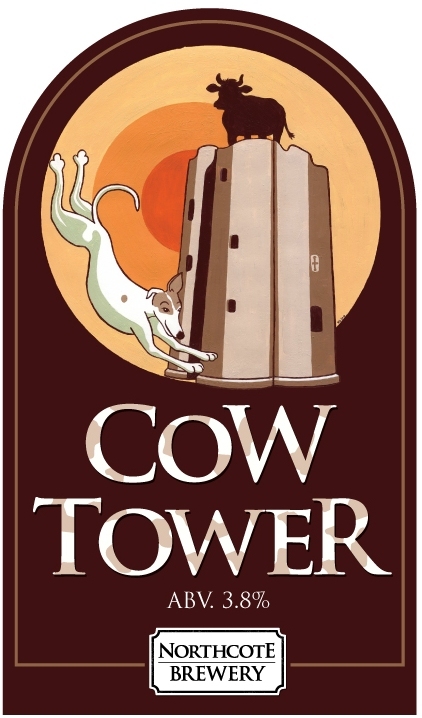 I did home brew, our first beer – Cow Tower – is based on a home brew recipe. It does change the final product to some degree, it will never be exactly the same, every brewing system does change the character of the beer. Not really, although I have my small pilot brewery system that I use to test recipes on. What is your favourite beer that you brew? I think Golden Spire is the favourite, I need to tweak it more to get it exactly how I want it, but it’s getting there. I’ve never worked in another brewery. It depends, if you are calling your beer a certain style, ie a Trappist type beer, then it should be fairly true to style. However, IPA is so open to interpretation these days, you even get hoppy porters getting called a black IPA, that you can’t be too picky with names, you end up with hundreds of different style names that are really just a slight tweak away from something else that already exists. There are a lot I’d like to work with, I think Hard Knott are very interesting they’re not worried about breaking some rules and creating really unusual and innovative beers. Firstly let me say a heart felt thanks to everyone who has bought the e-book or the calendar, it is very much appreciated and I hope you get plenty of use from whichever one, or both, that you bought. What's that you say? You didn't know about my e-book and calendar? Well, in that case let me recap. The e-book is a pocket guide to some of the many pubs in Prague. Please note though that the focus is on what I consider good pubs, regardless of the beer they serve. For example, I happen to thing that the Potrefena Husa chain of pubs is generally good, although I wouldn't drink Staropramen in them, rather Leffe Bruin. Rather than just a list of drinking establishments, the book also has 10 pub tours, with directions to the various pubs and some pointers to interesting things to see on the way. The price of said guide? Just $4.99 (that's just over 3 quid for the Brits and 3.75 Euros for those in Euroland)! I have said it before, and will say it again, the e-book features some wonderful photography by Black Gecko's Mark Stewart, who I hope to do some more collaborations with in the near future. Perhaps, though, you won't be heading to the world's most beautiful beer drinking city any time soon, but would like to whet your appetite for such a trip. Step in, then, the 2011 Fuggled Calendar. 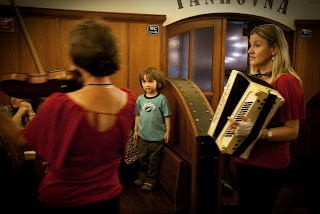 More beautiful pictures from the esteemed Mr Stewart, capturing the atmosphere of some of Prague's best pubs. What better for the beer and pub lover in your life, or just for lovers of great photography - Mrs Velkyal has the 2010 version in her closet at work, and will have the 2011 edition shortly. The price of said treasure trove of timely delight? 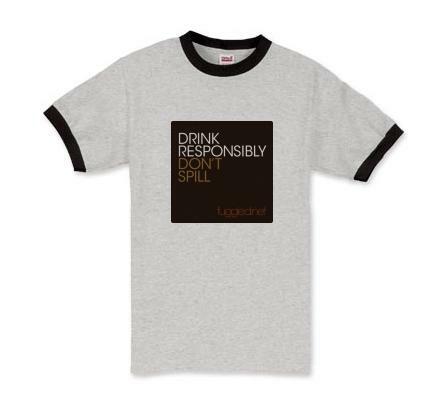 $15.50 plus shipping (slightly more than a tenner en Grande Bretagne, and about 11 Euros where applicable). In the side bar you can see buttons which will take you to the ordering pages for each product, so buy something for the beer lover in your life. Before announcing the winner of the first Fuggled Christmas Giveaway, I would like to make a meanderingly meaningless speech about how beer is more than just a sport, it is a unifying force in the world. I would like to, sure, but I am not Sepp Blatter and Fuggled is not FIFA, so I guess you good people just want to know who gave me the fattest of brown envelopes in order to win the coveted price. Firstly though, the answer to the question. The first pub to sell Pilsner Urquell in Prague was, of course, U Pinkasů. It was in 1843 that Jakub Pinkas gave up making ecclesiastical vestments to bring the new wunderbier to the people of Prague, just five months after Josef Groll's brew was first tapped in Plzeň. Today the pub is one of the better places to get a half litre of Pilsner Urquell, especially in the summer when the garden is open. The picutre above is by Mark Stewart, my photography guru and all round top bloke. Dan Herman, of Greenville, South Carolina! Congratulations, and I will be in touch later today to sort out colours, sizes and other logistical type things. To those that entered but didn't win, thanks for taking part! While on the subject of winning things, I was very happy to discover yesterday that I will be adding some more bling to my collection. My Samoset Vintage 2009, which I wrote about last week, took silver in the Strong Ale category at the Palmetto State Brewers' Open. At about midday on Sunday, I will no doubt be hungover. Tomorrow, Mrs Velkyal and I continue our mission to put thousands of miles on our car, by driving to Chimney Rock, North Carolina for her uncle's Christmas soiree. I may take the opportunity to rid my cellar of a back log of beer that I have to admit I am unlikely to drink - though I may keep a few bottles for beer hacking purposes. Whilst in the throes of said hangover, I will reach my hand out to my lovely assistant and ask her to draw a piece of paper from a hat, or some such similar vessel. On that piece of paper will be inscribed the name of the winner of the first Fuggled Christmas Giveaway, and soon to be proud (one hopes) owner of a Fuggled t-shirt, not too dissimilar from the one below. Which pub was the first to sell Pilsner Urquell in Prague? The email address is velkyal@fuggled.net, and please put Competition Entry in the subject line. The winner will be announced on Monday. What do craft brewers do that industrial brewers don't? Difficult question as I am sure you can imagine. I think at the time I answered that in terms of pure process, there is probably very little difference between an industrial brewers and craft brewers other than, of course, scale. When you look at the websites of major industrial brewing companies, you do get the sense that the brand is of primary importance rather than the beer. That is an understandable reaction when you look at sites for companies such as AB-Inbev, who have a multiple of brands within their business, and in some cases they own only the brand, and leave the brewing up to someone else. But I am not talking here about business procedures, after all, only an idiot starts a company with no intention of making a living out of it, either that or someone with enough money not to care. I am talking about their methods of making beer. Unless they are hiding something, AB-InBev claim that only 5 ingredients go into Budweiser. Again, unless they are hiding something, their process for making Budweiser looks exactly like the process used by every single craft brewer on the planet, apart from the beechwood aging that is. Now, you can argue until you are blue in the fact about the use of rice in beer, from my understanding it came about because American consumers in the mid 19th century wanted a paler, lighter bodied lager. The fact though remains that for the beer drinking masses of that time, Budweiser was what they wanted, just as for many a beer drinker today, a hoppy IPA is what they want. You could almost argue then that Budweiser, and pale lager in general, was the 19th century equivalent of the modern American IPA - all the rage among the beer drinking classes (by the way, that was everyone, not just "middle class tossers" to quote from this excellent post here). Ah yes I hear some say, but craft beer uses traditional ingredients. The question then becomes, traditional to where? The use of rye is traditional in German brewing traditions, of course German brewing being so much more than Bavarian brewing, though sometimes you have to wonder (and yes I know that the enforcement of Reinheitsgebot was a pre-requisite for Bavaria joining the single German nation state in 1871). But using rye in British brewing? There isn't much of a tradition to go on there, though I am sure that if I am wrong I will be told soon enough. Tradition is such a nebulous concept as to be irrelevant, at what point do you decide something is traditional? You could argue that rice in American lager is traditional, so should craft brewers be making American lagers that use rice, rather than co-opting a tradition from Germany or Bohemia? We won't get into the whole use of various extracts and adjuncts thing here, especially as so many of the Belgian beers beloved of the craft beer cognoscenti use hop extract and sugar. So, the ingredients are by and large the same, the processes are same, so what differentiates craft brewers from industrial brewers? In terms of something objective, the only difference is the size and scale of operations, and even that is up for debate. Sometimes this whole craft vs industrial debate sounds like kids in the playground and when one kids says "my dad is bigger than yours" the craft kid replies "but my dad punches with artisan style". Thinking this all through has given me a new appreciation for the likes of AB-InBev and SABMiller, because for all their failings, they do produce well-made, quality products. Sure, they may not be the kinds of beer I want to drink on a regular basis, but you would have to be exceptionally pig-headed to claim that Budweiser is a poorly made product. They may not be putting the ingredients together in a way that I enjoy, but there are an awful lot of people out there who like what they are doing. I guess for me, at the end of this pondering and pontificating, it is simple. I drink the beers that I enjoy, regardless of the producer. So I will still drink Guinness on occasion, Pilsner Urquell in the right circumstances and something from Michelob when the mood strikes. Sure, mostly I will drink what is labelled "craft beer", but is it necessary to be fanatical about it? I think not, it is, after all, just beer. The important thing is to enjoy what you are drinking, who are drinking it with and where you are drinking it. This time last year I started what I hope to be an annual tradition, brewing a barleywine in late November or early December and letting it sit until the following Thanksgiving. In trying to think of a name for the beer in question, I batted about several ideas, including Vintage Velky Ale. In the end I settled on the name Samoset Vintage. Anyway, so last November I brewed the first Samoset Vintage Ale, a barleywine which once fermentation was done, weighed in at 12% abv. In the boil I used Challenger and East Kent Goldings, I then dry hopped the beer with Cascade for a couple of months. The malt bill was simplicity itself, lots of pale dry malt extract and a pound of Caramel 40 for colour and flavour. The yeast was 1728 Scottish Ale from Wyeast. Given that last week was Thanksgiving, it was time to finally enjoy, I hoped, the beer. A quick disclaimer though, I had a bottle in June to make sure it was carbonated properly and then another when I tried not to get in the way of brewing the Pilsner with Devils Backbone. So to the beer itself. As the pictures quite nicely show, it pours a rich dark copper, topping off with a large, off-white, rocky head that hangs around for the duration - and with a quick swirl of the glass refreshes itself. The nose is by turns lemony, lightly piney, boozy and earthy, then as it warms it becomes quite spicy, almost curryesque. In terms of taste, the first mouthful is a hefty hit of caramel sweetness, but not cloyingly so. The bitterness of all the hops comes through in the finish to cut through the sweetness leaving a nice balance. As the bitterness fades there is a warming afterglow of booze. The beer is quite full bodied and has a nice level of carbonation that is not overly fizzy, but not "flat" either, given the good head on the beer it is not really all that surprising that the beer left plenty of lacing down the glass. The only downside to Samoset Vintage 2009 is that it is deceptively easy to drink. The alcohol is very well integrated and if I hadn't known the alcohol content then I would have been happy to drink my entire stash of the beer, and then wonder why my legs refused to function. Actually, there is another downside to the beer. I only have 7 bottles left, and I was hoping to age at least a 6 pack for next year's Thanksgiving - and do a comparison with this year's, yet to be finalised, recipe. Perhaps I only need a couple of bottles though? You could say then that I am very happy with the end result of my first barleywine, and you'd be right! * I made that bit up. Tomorrow, as I am sure you know, is Thanksgiving over here. As such, Mrs Velkyal and I drove from Charlottesville to Chimney Rock, North Carolina yesterday. Admittedly we have since driven on Columbia, South Carolina, but stopping in Chimney Rock was mainly to see Mrs V's uncle and partner as well as to deliver 48 bottles of homebrew. Said uncle has a cleaning business and likes to give his clients a Christmas hamper of hand produced goods each year. This year he asked if I could give him some bottles of my Machair Mor Chocolate Export Stout and Biere d'épices which he had enjoyed last year. Naturally I obliged and all the beer was safely delivered last night, with a couple of bottles extra for sampling to make sure everything worked out well. Suffice to say that I am not taking any of my beer back to Virginia on Sunday! Anyway, family duties call. So happy Thanksgiving everyone! When Mrs V and I went to Williamsburg back in October, I bought a growler of Williamsburg Alewerks' Washington's Porter. As with the best laid plans of mice and men, my original intention to drink said growler never happened, and so it sat in the fridge for the last few weeks. Wanting to both use the beer, being loathe to waste it, and also because I love cooking with beer as much as drinking it, I decided to use it for a few culinary projects. Waking up with something of a hangover yesterday morning I decided I would make a fruit cake, which seems to be something of an acquired taste this side of the Pond. Traditional fruit cake from home starts off the night before baking with steeping the dried fruit in tea. My plan however was to ditch the tea and replace it with the porter. The recipe I used came from a small Czech language Irish cookbook I bought several years ago in Prague and I adapted it somewhat. Firstly steep the dried fruit, sugar and spice in the porter overnight, or for 8 hours. When the steeping is done, lightly beat the eggs and add them to the mix. Stir in the flour and baking powder to make a thick batter. Usually you would just use a single large cake tin, but I used three disposable loaf tins, which I sprayed with oil before filling about half way. Heat the oven to 300 degrees Fahrenheit and bake for about 2 hours, or until you can put a knife in the centre of the cake and it comes out clean. So there we have it, three fruit cakes for Thanksgiving, moist, dark and spicy......like a good porter! This week's homebrewer interviewee is the winner of many awards at things like the Dominion Cup and Virginia Beer Blitz, as well as being the person who encouraged me to join the Charlottesville Area Masters of Real Ale (CAMRA). 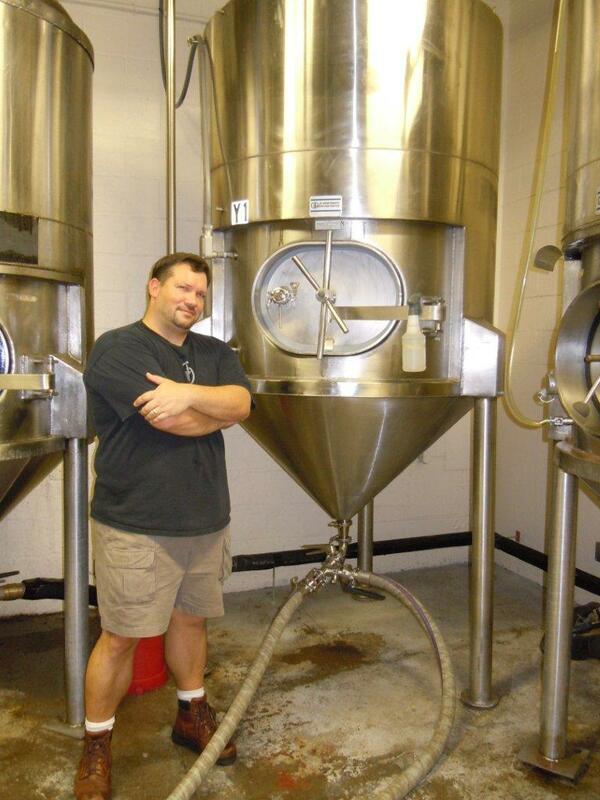 I started homebrewing back in 1996 when I was living down in Charleston, South Carolina. I guess there were two forces at play at that time. S.C. still had limits on the ABV for commercial beers back then, and brewing the beers and styles that I couldn’t buy sounded like a fun experiment. Also, I was managing restaurants back then and I still believe there are many shared personality traits between chefs and brewers. Both want to craft something special where they can show off their creativity, technical skill and, most importantly, share that with others. Are you an all grain brewer or extract with grains? I’m all-grain brewer, but I partial-mash brewed for a long time. I’ll never disparage extract brewing because you can make some amazing beers with extract and some grains. I think it mostly gets a bad rap because everyone starts by brewing with extract and, when you are new, your first few beers can be trying because you are still getting your head around pitching rates, sanitation, the boil and temperature control. When I was new, there were a lot of things that went wrong, but you can’t blame the extract until you have a good process. What is the best beer you have ever brewed and why? Most of my tasting friends (guinea pigs) would say it was one of my hoppy IPAs, but I think the best beers I’ve created are my sours. Flanders Reds can take almost 18 months to turn the corner and be drinkable. And once they do, they are amazing. But the technical skill and sanitization needed to make those beers (and not infect your other beers) is higher than your normal batch. And the stakes seem higher when you have one that takes that long to mature. That makes them more rewarding to me, right now. What is the worst, and why? I’ve made some bad ones over the years. One that tasted liked 5 gallons of wet cardboard always comes to mind. I think the worst was a pumpkin beer. Spices are so hard to do just right. I find you have to use half as much as you think you will need, and then I make a spice tea to blend to taste at bottling time. A made a pumpkin beer that was undrinkable. It literally tasted like liquid nutmeg and allspice. I think it is whatever I’m making right now. In the fourteen years I’ve been brewing, I’ve never made the same batch twice. I get obsessed during the planning stage and I love the research and formulation of the recipe. Do you have any plans or ambitions to turn your hobby into your career? That’s a great daydream that I have, but I think I’ve missed my window. I feel like I’ve gotten too old to take the risks, financial and otherwise, necessary to brew for a living. I’ve thought about doing the nano-brew thing a few times, but there aren’t enough hours in the week. But I might have been a brewer in another life. I say that because I like to brew more than I like to drink beer. And I like drinking beer A LOT. Usually it is a nice, balanced American Pale ale, or a Berliner weisse. When the hops and malt are balanced, and the ABV isn’t too high, nothing is easier to enjoy than an APA. Berliners are wonderful, too, because they are session beers and they have a refreshing sourness to them that can pair with many things. Whether that be food, or having a cold one on your porch on a nice day. How do you decide on the kind of beer to brew and formulate the recipe? I really have to be excited by a beer in order to be motivated to make it. I’m like that about a lot of things in life. If I’m not interested, I’m probably going to do a piss poor job. If I’m hooked, then I’ll knock it out of the park. Lately I’m about challenges. I like to clone beers that I’ve never had before. I like to try unusual ingredients or styles. I’m looking to make brown ale with wild rice soon, and I want to take a swing at a Gose. What is the most unusual beer you have brewed? Well, I’m known for my strange ideas, so that’s a hard one to answer. I did a coconut curry hefeweizen a few years ago that was inspired by a Charlie Papazian recipe. I used fresh ginger, fenugreek and a good friend sent me Kaffir lime leaves from Thailand for it. It was a very interesting beer but it had a slow, spicy burn to it. I called it “Bombay the Hard Way”. My other infamous one was my oyster stout where I added actual raw oysters and their shells during the last few minutes of the boil. Although it was a challenge to get my friends to try it, it turned out great and had a mind hint of brine to it. Which professional brewery do you look up to and why? This changes all the time but I’ve been a fan of Jolly Pumpkin for quite some time. I’m a big sour head and they do some amazing things with their oak barrels covered with wild yeast and bacteria. I have never had a bad beer from them, and the fact that they have a sour session beer, the Bam Biere, is genius and quite inspirational. It started with a simple enough request. 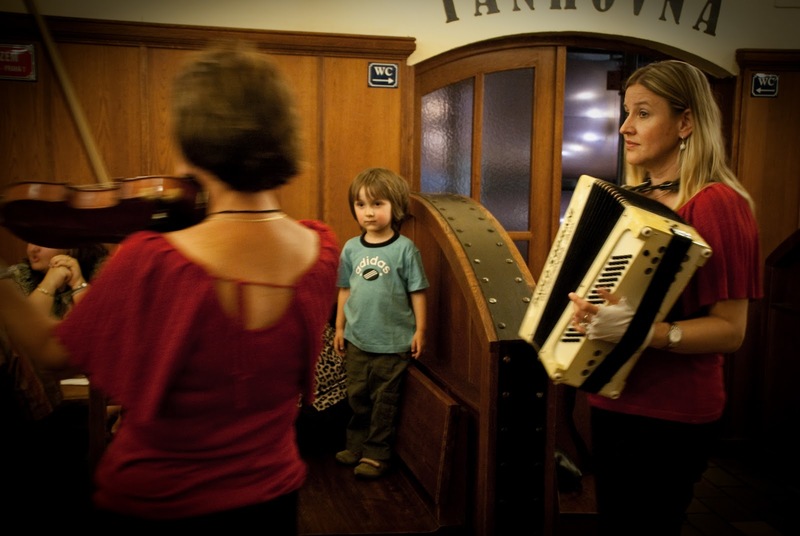 Would I show a friend and relative newcomer to Prague some of the city's best pubs? Well of course I would. The original plan was to meet up on the nights when my friend's wife and Mrs Velkyal would have their knitting, crocheting and general craftiness nights. My friend, of course, was Mark Stewart, who had been our wedding photographer and then became a firm friend and drinking buddy. As I pondered on the places to take Mark, I decided that I would write a pub guide to Prague, although the original working title was Prague Pubs - A User's Guide. Given that Mark is a talented photographer, I asked if he would be interested in making it a collaborative work, which thankfully he agreed to. The upshot of all this was that for the last couple of months in Prague, we spent many hours in various pubs, drinking, taking photos and taking notes. In the process of actually creating the final document there were technical issues, mainly to do with creating a PDF file from OpenOffice, changes in the names of one of the pubs in the guide and various other little things that needed addressing. Finally everything worked out last week when I created the Pocket Pub Guide - Prague, an e-book which is available from Lulu.com. A quick overview then of the book, information and pictures of 40 pubs in Prague and 10 guided pub tours of the city. Simple really. However, nothing is ever really all that simple. How do you choose the 40 pubs to go into the guide? The name of the book itself helps, the guide is about pubs rather than beer - I am a firm believer that a good beer selection does not necessarily make a good pub, and vice versa, some of my favourite pubs in Prague have shocking beer. Hence there are some well known and historic pubs which are not in the book, simply because I don't like them as pubs - perhaps the service was awful, perhaps the atmosphere was crap. Whatever the reason, I didn't like them so they didn't make the cut. I am sure some will look at the pubs that are in the guide and wonder why I am advertising places that sell Staropramen or Kozel? Firstly let me assure you that the only money that passed hands during the creation of the guide was from my pocket to the pubs in the guide, I haven't taken a penny from anyone to make this. The answer then is simple, sure Staropramen is not a beer I would choose to drink on a regular basis, but Potrefena Husa pubs are nice places to drink, and they often have Leffe Bruin on tap, which while not great is a decent beer. If I remember rightly Evan commented in his seminal Good Beer Guide to Prague and the Czech Republic that "capricious whimsy" played a major part in the pub section. So it is with the Pocket Pub Guide - Prague. So, if you are planning a trip to Prague, the e-book is just $4.99 from Lulu.com - either click here, or on the blue icon in the sidebar under Pocket Pub Guide - Prague. If you are looking for gifts for your beer drinking buddies, then have a look at the 2011 Fuggled Calendar, again featuring the photography of Mark Stewart. That's the guides and calendars part of the title dealt with, now for the giveaway. I am in the process of creating a range of Fuggled merchandise, beyond the calendars and guide, which I plan to launch in the new year. However, I have decided to give away a Fuggled t-shirt like the one shown below. 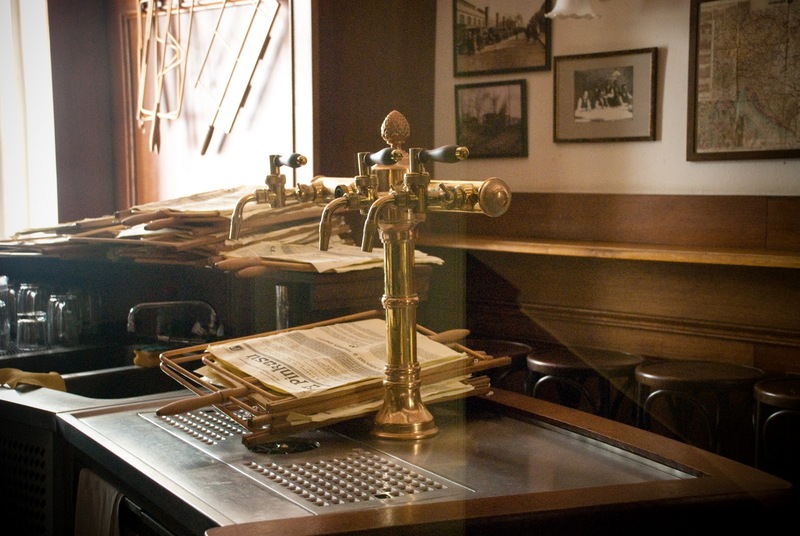 which was the first pub in Prague to serve Pilsner Urquell? Only email entries will be accepted, posting the answer as a comment will result in the comment being deleted. The winner will be chosen from a hat by the ever glamorous Mrs Velkyal on December 5th. 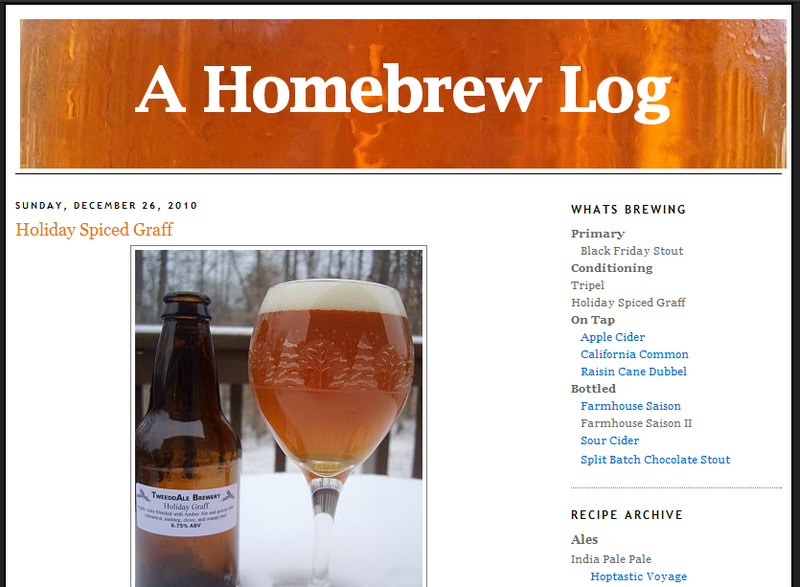 Last Monday, James from A Homebrew Log wrote about three of my beers I had given him, and so today I return the favour and write about three of his beers. When we traded beers, he gave me a bottled conditioned saison, an award winning Octoberfest lager and his amber ale featuring homegrown Galena hops. In my fridge, I still had James' Inferno Chili Lager and his cider (proper cider that is, you know, the kind with alcohol). First in to the ring is the Inferno Chili Lager. If you read this blog regularly you'll know that I tried Eric's, of Relentless Thirst renown, poblano honey chilli ale a while back, so I was expecting something similar here - gently heat rising as the drinking went on. The beer poured a light copper colour and topped off with a thinnish, but persistent white head. The aroma was pure chilli, backed up by a touch of caramel sweetness, but it was chilli in the driving seat. Oh boy, clearly the driving seat this chilli is sitting in is for an Aston Martin because the flavour ramps it up big time, this is a spicy beer. Again there was a toffee thing in the background which just took the heat off a smidge, but hot chillies is the order of the day, a warm start which just builds and builds. If you like chillies, which thankfully I do, this is a really good beer. Round two was James' American Amber Ale. As you can see from the picture, the beer is a dark amber with a billowing off white head. As you would expect from a beer using American hops, the nose was dominated by pine and citrus, but there was a sweet fruitiness lingering in the background. Tastewise, the beer was malty up front, the sweetness of caramel malt coming through and then being balanced out nicely by a healthy hoppy bite. This was a beer I could happily drink all night in the pub and drink plenty of, a very nice beer again. Yesterday after working in the Starr Hill tasting room, I got home to a ready cooked dinner and decided to launch into the third of James' beers - the other two were enjoyed on Saturday. The Octo-Berfest, which won silver at the Virginia Beer Blitz, is obviously an Oktoberfest style lager, and had a fun label that made me wish I had an ounce of artistic ability. The beer itself was deep copper, the ivory head fed by a constant stream of carbonation. 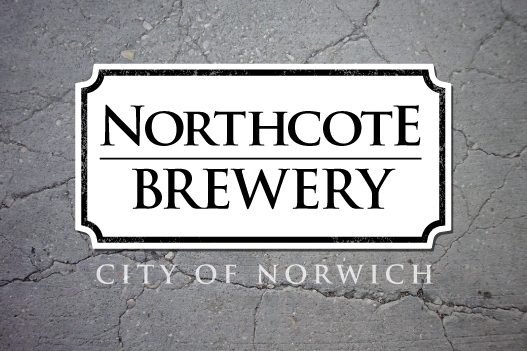 The nose was the classic noble hop aromas, floral and grassy with a slight edge of lemon, there was also a touch of caramel sweetness coming through as well. The malty, caramel sweetness was a major player in the drinking, backed with a firm bready quality that really worked well. Infinitely easy to drink and the alcohol was very well integrated. I don't often do this, but this beer would pair very well with a curried pumpkin soup and pot roasted venison served with fresh green beans, which is just as well, as that was dinner last night! Once again James has come up trumps with his homebrew and more than ever I am glad that the entries I took down to South Carolina for him are not in the same categories as any of my beers! One thing I am learning is that Virginia is not only blessed with excellent commercial breweries, but also some excellent homebrewers as well. Well that's an interesting story - I kinda backed into it in some ways. I had been homebrewing off and on for years, and then one day I was on duty (LA Firefighter) - and we were battling a brush fire up in Glendale. My partner and I were super thirsty and complaining about how we didn't have anything to drink, and the idea just hit us - why don't we make our own beer. 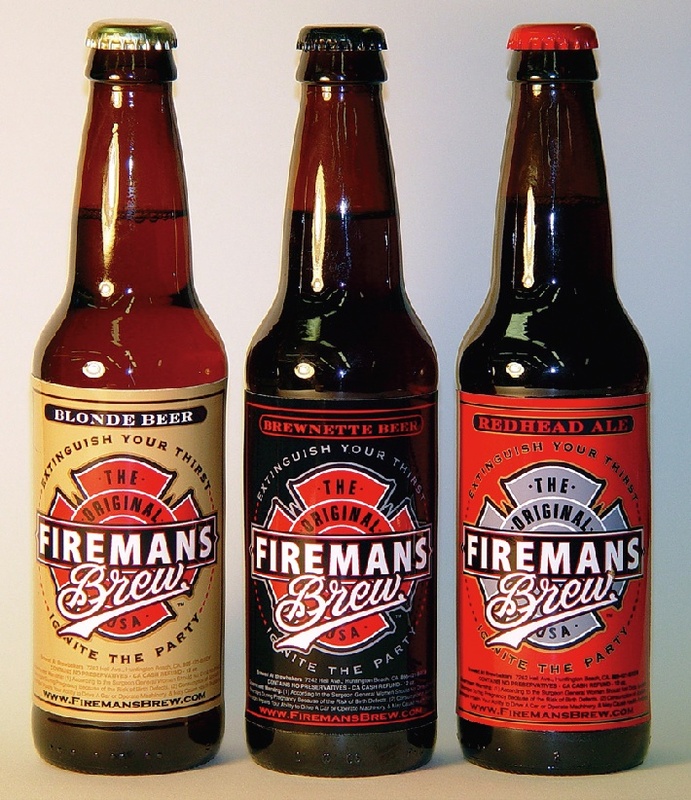 Beer brewed by Firefighters for Firefighters – and everyone else. 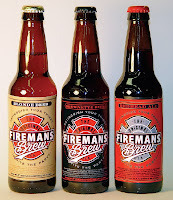 So from that point on the idea of Fireman's Brew just kinda stuck and we started working on it. To me, brewing beer is really a mixture of art, science, intuition and taste, so the most important characteristics of being a good brewer is really a combination of those. Beyond that, I think brewers need to be a little daring at times, to try out new things and push the envelop and their comfort zone. But I also think that brewers have to be a bit selfless, because most of the time we're not brewing for ourselves and what we like to drink, we're brewing for the enjoyment of others – so the quality has to be there day in and day out. Yes, I started off homebrewing and still make up a batch every now and then. Pretty much all of the Fireman's Brew beers (Blonde, Brewnette and Redhead) started off as homebrews. When we were first getting started, I would homebrew up a batch and test it out on friends, and then refine the recipe based on their feedback. Looking back, it actually worked out really great for us, because we were able to perfect our recipes before jumping into larger scale production. Rarely. There’s not enough time! My favorite right now is our Brewnette – it’s a traditional German style Doublebock, made with imported hops and variety of malts. It’s a perfect beer for autumn & fall – with a rich chocolate / mocha finish to it, that’s still very smooth. All of our beers we make by hand, and the Brewnette is our toughest & most complex one to make, but also really rewarding – because it’s really a great example of what hand-crafted beers are all about. Favorite to drink is our Redhead. It’s our Amber Ale, and we’ve really worked hard to get the taste profile right. We use crystal malts in this one to give it a toasty malt base and caramel finish – but it’s not syrupy sweet. 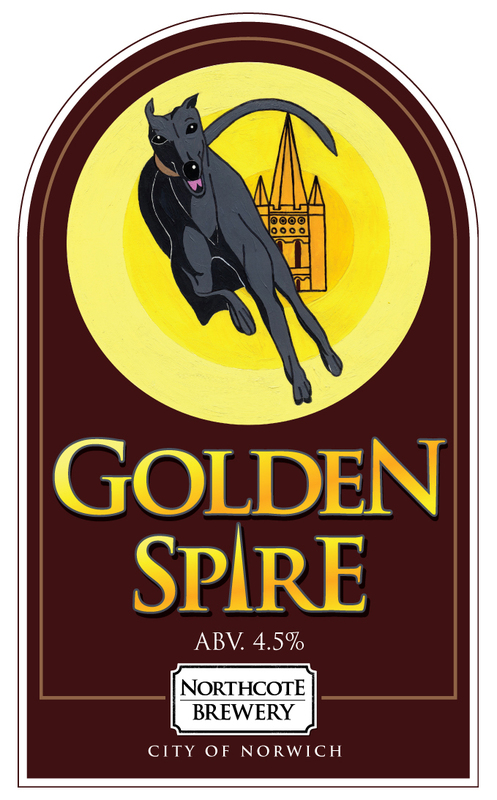 I have to say that this one is our most improved beer over the past year, as we’ve continued to refine it. For us authenticity is key – we make all of our beers by hand and use only natural ingredients, so authenticity and quality of the ingredients are paramount. 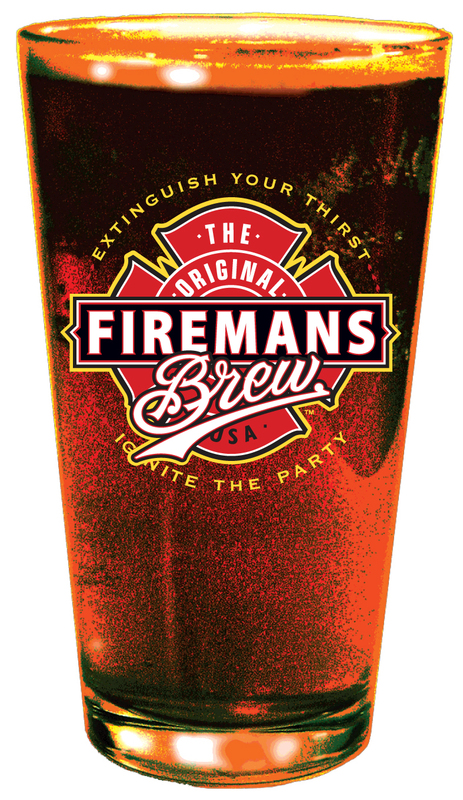 Plus, it’s what we’ve built our brand on – our beers have to stand up like you expect Firefighters would – strong, dependable, down to earth. Wow, there are so many great ones out there – especially out here on the West Coast. We’re real fans of Stone, the guys down at Coronado Brewing Co., and Georgetown Brewing up in Seattle, but I’d have to go with Vinnie Cilurzo at Russian River as my top pick for working with. Vinnie, give us a call – we’d love to team up with you! Going back to the previous question, Russian River’s Pliny the Elder. If it's not about the beer, then what is the point?